What do you guys think of the colorsheme? I like it because, while it is unmistakably Slaanesh, it is also not the usual Slaaneshi colour scheme. I look forward to seeing him/her/it finished! 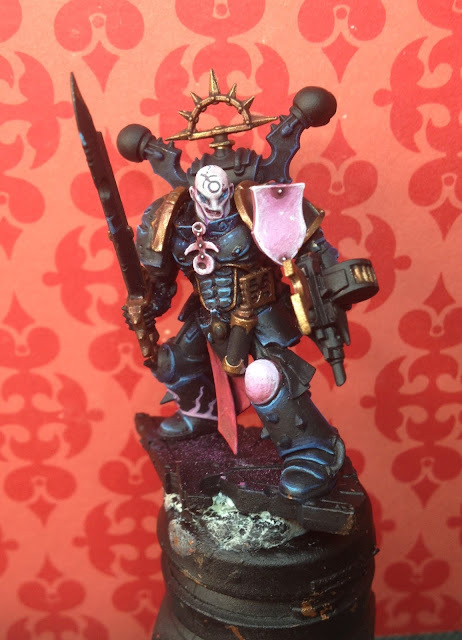 A blue-back combined with the usual Slaaneshi colours of pale pink and brass? I'll just carry right on then! Sanguinary Guard torso?!? That's just awesome. Great idea. I really like the sculp and the conversion, same goes for colour-scheme but think i would add more bright/rich to the metal and go for dark red instead of pale red for linecloth.